Overview - A veteran war journalist documents atrocities in the crossfire between Georgian and Russian forces, and finds that releasing the footage, given the overwhelming lack of interest from news networks, is equally as challenging as physical survivial. When adapting any real-life event into a movie, a filmmaker usually has one of two options. They can go in a very authentic direction, portraying the events in an almost documentary fashion with few dramatic deviations, or they can opt for a more sensationalized, traditional approach that fictionalizes the events into a standard Hollywood formula. '5 Days of War' actually offers a bit of both styles, providing instances of true-to-life legitimacy with more overt moments of classic action film convention. From director Renny Harlin (no stranger to over-the-top action with flicks like 'Die Hard 2' and 'The Long Kiss Goodnight') the movie's mixture of gritty realism and more bombastic bravado make for an uneven, ultimately mediocre but still solid effort. Inspired by the actual five day war between Georgia and Russia in 2008, the film follows a war correspondent, Thomas Anders (Rupert Friend), who finds himself entangled in the dangerous conflict. After befriending a local woman, Tatia (Emmanuelle Chriqui), Anders and his cameraman, Sebastian (Richard Coyle), end up witnessing the slaughter of several innocent villagers at the hands of vicious mercenaries hired by the Russians. With the injustice captured on video, the group fights to get the footage out to the world before the mercenaries track them down and destroy it. Injecting a fictional story into the actual real-life events, the script is an interesting but not completely successful blend of sensibilities. Character work is pretty by-the-numbers with a set of stock archetypes, personalities, and relationships. After setting up the character's tragic backstory in an opening flashback, Anders becomes a perfectly serviceable but not terribly compelling lead. As performed by Friend, the role has a certain heroic quality but lacks real charisma. The rest of the cast are all decent, but again no one really sticks out and as written none of the characters are all that original or memorable, which leads to a slight disconnect from caring about their dangerous journey. With that said, there is a decent examination of the war journalist lifestyle, illuminating the precarious line between merely documenting and actually engaging in events. The plot itself bounces around from following Anders in the field to focusing on the Georgian president, Mikheil Saakashvili (Andy Garcia), as he tries to deal with the escalating crisis. While these sequences with the president do provide a more well rounded examination of the conflict, filling in details about the war that would have otherwise been skipped over, the scenes are a little underdeveloped and pretty much disappear during the second half of the film. Director Renny Harlin brings a quasi-documentary shooting style to the proceedings and alternates between low-key discussions and conversations in between the chaos, and exciting set pieces set in the thick of battle. Slow motion and POV shots help to increase the tension and despite the film's relatively low budget, Harlin is able achieve a high level of production value on screen. The numerous action scenes and various shootouts are quite impressive and the director keeps CG to a minimum in favor of practical effects. While the battles are thrilling, the film's introduction of some very 'Die Hard' like mercenaries clashes with its more realistic qualities. The plot eventually relies on very basic genre conventions with a climax that involves the love interest being kidnapped by a particularly unsavory bad guy. Coupled with various last minute reversals of fortune -- where characters are saved by others right in the nick of time, or villains suddenly have a striking change of heart -- and the film sort of collapses in on itself becoming a generic and unrealistic action thriller that just happens to involve a real-life recent conflict. '5 Days of War' does a decent job of dramatizing the events of the Georgia/Russia conflict but can't quite find the right balance between fact and fiction. The director can't seem to decide whether he wants to adhere to a classic Hollywood formula or present a more raw, authentic tribute, leading to an odd mixture of realism and cliched action film conventions. An ending which includes several real-life survivors of the conflict sharing their stories is touching, but the heartfelt testimonials are very out of place and only serve to further illuminate the film's uneven tone. Still, despite its historical shortcomings and by-the-numbers plot, the movie has definite entertainment value. '5 Days of War' is brought to Blu-ray by Anchor Bay on a single BD-25 disc housed in a keepcase. Some skippable trailers play upon startup before transitioning to a standard menu. The packaging indicates that the release is region A compatible. The film is provided with a 1080p/AVC MPEG-4 transfer in the 2.40:1 aspect ratio. Shot digitally in high definition this is a very impressive transfer that features strong clarity and dimension. The source is pristine with some negligible digital noise here and there. Fine detail is often exceptional with a very sharp image that reveals even the tiniest and most intricate bits of visual information. From the bruised and battered faces of the main characters to the ruble and debris filled streets of Georgia, the video offers a sometimes stunning level of clarity. A shot featuring a fiery stream at night is particularly impressive and many more peaceful images of quiet countryside villages are also strong with vivid colors that offer pleasing vibrancy while still retaining a gritty tone. Black levels are mostly consistent and provide a frequently inky quality. Contrast is high and while whites veer toward a deliberately overexposed look, the intensity suits the content well. A few quick shots here and there (usually in the midst of intense action) feature a more overtly "cheap" digital look with overly smooth motion, but thankfully this is rare and doesn't detract much from the presentation. 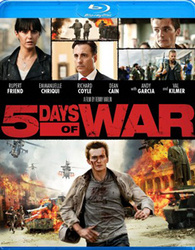 '5 Days of War' isn't quite worthy of a five star video rating but it's actually pretty close. Free of any major technical anomalies and featuring sometimes striking levels of fine detail, rich colors and solid depth, the image is very impressive. The movie is presented with an English Dolby TrueHD 5.1 track. Subtitle options include English SDH and Spanish. Bustling with action, this is a powerful and immersive mix. Dialogue is clean and full and remains audible amidst all the chaos with no crackles or hisses. Directionality across the entire soundscape is great, perfectly emulating a war-zone environment. Bullets whiz by from all directions with piercing fidelity and separation. Even quieter sequences feature appropriate ambient effects with gentle chatter and echoes of activity hitting the rears. Ominous jets flying overhead and many huge explosions provide room shaking rumble, all adding to an enveloping auditory experience that places the listener right in the thick of battle. Dynamic range is excellent, showcasing a wide gamut of frequencies from soft, gentle sounds to more aggressive, loud effects with no distortion. Thankfully, all of the mixing is well balanced with explosions, speech and score never overpowering each other. The mix does a great job of bolstering the exciting action with an occasionally all encompassing soundscape. Much like the video transfer, this is a strong track that's pretty close to being demo material. Commentary with Producer/Director Renny Harlin - The director provides a solid track full of production trivia and facts. After a particularly amusing introduction, Harlin spends most of the running time discussing the actual conflict that inspired the film's story, the close-knit living arrangements between cast and crew on location, the many authentic Georgia locations used (they actually shot in the real President's office), the authentic military equipment featured, and the lack of CG effects. Though the track didn't exactly increase my appreciation for the movie, fans should definitely take a listen. Deleted Scenes (HD, 11 min) - Presented in 1080p, this collection of excised scenes is included in one chunk with no chapter breaks. We get a bit more with Anders before he leaves LA and extensions of several ride-along conversations between various characters that provide more development. One deleted scene even features a few alternate angles and takes. Though there is nothing particularly memorable here, these brief cut snippets are certainly worth checking out. '5 Days of War' is a decent action film that can't quite find the right balance between historical accuracy and dramatic conventions. Despite its low budget, the numerous set pieces are solid but several formulaic characters and plot developments hold back a potentially effective retelling of a recent real-world conflict. Video and audio quality are great, providing near demo worthy material. Supplements are slim but the commentary and deleted scenes are solid inclusions. Though a fairly mediocre effort, this disc is still worth a look.